Hugh Lofting's sequel to The Story of Doctor Dolittle, which first introduced us to the very special man who could talk to the animals and come to their aid. The Voyages of Doctor Dolittle takes us to Polynesia and beyond, far from his home of Puddleby-on-the-Marsh. 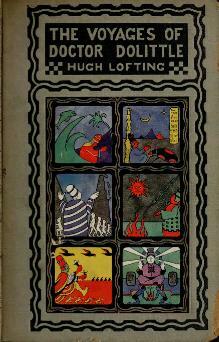 The book, written and illustrated by Lofting, was published in 1922. Its subtitle, "The Popsipetel Picture-History of King John Thinkalot," invites us to embark on the doctor's fanciful adventures. It won the Newbery Medal in 1923. This book is featured in our collection of Books for Young Readers. The Eighth Chapter: Are You A Good Noticer? Part Two - The First Chapter: The Crew of "The Curlew"
Return to the Hugh Lofting library.